Triangle, Trisection of Sides, Perimeter. Square Diagonal, Inscribed Circle, Arc, 90 degrees. Heptagon Regular, Side and Diagonals. Proposed Problem 64: Triangle, Incircle, Transversal. Proposed Problem 65: Right Triangle, Mindpoints. Proposed Problem 66: Triangle, Excircle, Tangents, Geometric Mean. 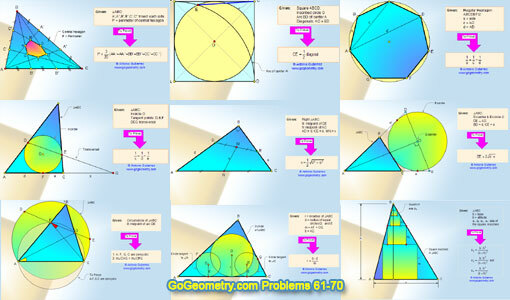 Proposed Problem 67: Triangle, Circumcircle, Angles, Cyclic Quadrilateral. Proposed Problem 68: Triangle, Incircle, Inradius, Tangent, Similarity.